(CNN) -- This week marks one of the most-exciting non-major events of the golf season -- the Players Championship at the famed TPC Sawgrass. With a deep field and a great course, you won't want to miss any of the action. Before the tournament tees off, we had a chance to catch up with TPC Sawgrass PGA Head Professional Matt Borocz, who provided some inside insight on the home of the PGA Tour. PGA.com: Thanks for joining us. This week presents one of the most exciting on the schedule with the Players Championship. What is it that makes the Players such a special event? Borocz: It's the Players Championship... The Players is crown jewel of the PGA Tour. The world's best golfers are on a course that demands the highest level of shot-making and offers an unbelievable fan experience. It's also the highest purse in golf with the champion taking home $1.71 million at the end of the week. The Players Stadium Course was specifically built to host the Players Championship and offer our fans the best possible viewing. Everyone wants to see the action on the final three holes, especially the 17th. 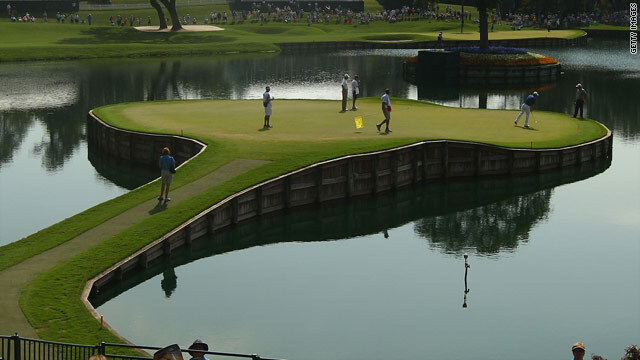 It's the lure of the hole and watching the best players in the world challenge the island green. PGA.com: We can't talk about the Players without mentioning the world-famous, par-3 17th island green, which you just touched on. I recently heard a promo with a player saying, "51 weeks a year, No. 17 at TPC Sawgrass is the easiest hole in the world for Tour players." I don't know if I would agree with that, but of course, that 52nd week is the Players. We know why it's daunting, but it's less than 150 yards. Is there any truth to what that Tour player said? Borocz: A few stats on the 17thhole -- it plays 121 yards from the middle of the championship tee to the front of the green. To the back of the green it's 146 yards. The 17th green is 3,912 square feet compared to the average of 4,500 square feet. The challenge of the 17th hole is its ability to taunt the mental toughness of a player. It's a very calculating shot because you have to factor the wind, firmness of the green and avoid looking at the body of water surrounding the island green. During the Players, you add in the thousands of fans! We give tours every day to visitors and the No. 1 comment of amazement is, "The green looks so small compared to television." Making a par 3 on the 17th hole at TPC Sawgrass will bring a smile to all players, whether they are a novice or the best players in the world. PGA.com: Henrik Stenson of Sweden is your defending champion. Through the years with the likes of Stenson, Sergio Garcia, Adam Scott, Stephen Ames, Steve Elkington, Greg Norman, Nick Price -- the list goes on -- the Players has had quite a list of international champions. What is it about the course that yields such diverse champions? Borocz: In the 36-year history of the Players, 10 of the victories have been by international players. The Players Stadium Course does not favor any style of player. The goal of former Commissioner Deane Beman was to create a golf course that had balance in regards to distance, wind direction and shot-making. He wanted to create a goal course that was fair and would challenge every skill of the game. The goal at the end of week is to crown the greatest player in world. The diversity of the field allows the Players and PGA Tour to expand the scope of the tournament to a world-wide audience. PGA.com: In 1994, Greg Norman won the Players with a remarkable 24-under 264. That's by far the best winning score in tournament history. Is there any chance someone could come within a sniff of that this year? Borocz: In 1994, when Greg Norman set the overall tournament record, the conditions started off perfect the first round with 76 players shooting under par. Norman started off on Thursday with a course-record round of 63, followed by three rounds of 67's to beat Fuzzy Zoeller by four shots. In 1994, the Players was played in March. With the tournament now being played in May the course is much firmer and faster conditions. In March, we had a lot of inconsistency in weather. It could be in the high 70s and beautiful or in the 50s with rain. The temperatures have become much more consistent, but the golf course plays much differently. When played in March, the golf course was overseeded. It's now Bermuda grass all year. The golf ball has more opportunity to run through the fairways and the greens. The forecast is shaping up to be a beautiful week. PGA.com: Final question. What's the best part about working at TPC Sawgrass? Borocz: Excellent question... TPC Sawgrass is a very special place being that it's the home of the Players and PGA Tour. It is a privilege to work around such a passionate and dedicated group of people. Everyone on our team is focused on creating a magical experience for the Tour players, members and guests. Every team member comes to the club with a positive "can do" attitude. We have a team that is extremely dedicated and passionate about their role at the club. One of the most special things about TPC Sawgrass is the interaction with all the people that travel from all over the world to visit. Many of them have personal stories and connections why TPC Sawgrass is their favorite course. There are definitely days that you have to pinch yourself. We are very fortunate to have the opportunity to work at such a beautiful place that is showcased to the world every year. As a club and being apart of the PGA Tour, we have a lot of involvement with local charitable organizations. Almost every month we have a charitable initiative that we are giving back to you. It's an honor and a blessing to be a part of such a great team.